Can extreme climatic events affect the robustness of aquatic ecosystem restoration? Project lead: Lisette de Senerpont Domis & Cleo Stratmann. 01 April-31 July 2019. (Description of the planned experiment and scientific background, see below). 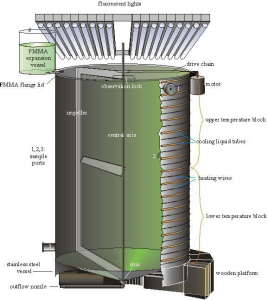 Timing of the Limnotron experiment: The large-scale mesocosm experiment is planned for four months. This will include experiment preparation, conduction and after-work, where all participants are expected to participate as an integral part of the application period. We encourage a wide range of Transnational Access (TA) users to apply: You may come from public authorities, technological partners, and research or teaching institutions. We especially welcome microbiologists, molecular biologists, biogeochemists, and aquatic ecologists in general to participate in our extreme event experiment, and to come up with additional experiments which can be run adjacent to the extreme event experiment. A total of at ca. 300 person days will be allocated to external users through Transnational Access provided under AQUACOSM for 2019. It is anticipated that AQUACOSM will support stays of at least 5 persons for ca. 50 days, or potentially other combinations. If you are interested, please contact us (l.desenerpontdomis@nioo.knaw.nl) well before the application deadline, so we can advice you about possible options. Introduction to the project: Extreme climatic events (ECEs), or episodic weather events that are increasing in frequency and intensity as the climate shifts, often have disproportionately longlasting effects on the functions of lakes and reservoirs. As these ecosystems play an integral role within the environmental and anthropogenic community, it is pertinent to rehabilitate degraded systems to a state where biophysical functions are resilient to the effects of future ECEs. Healthy, oligotrophic freshwaters are thought to be more resilient to the impacts of ECEs than meso- or eutrophic freshwaters. In the proposed project we will investigate to what extent re-oligotrophicated systems compare to eutrophic systems when affecteded by ECEs. Description of the Limnotron experiment: In a four-month experiment, we will investigate whether rehabilated systems are more resilient to extreme climatic events than non-rehabilated systems (Fig. 1). We will inoculate the mesocosms with sediment and water from a well-studied eutrophic water body. To four of the limnotrons we will aply phosphorus sorbents to geoengingeer our initial rehabilated conditions. Four limnotrons will remain in their initial eutrophic conditions. During the course of our experiment we will then apply to both treatments (eutropic vs. re-oligotrophied) extreme precipation events, as well as extreme heatwaves. We will use long-term meteorological data as a starting point for designing the exact nature of our climate event scenarios. Figure 1: Set-up of Extreme Climatic Event experiment. Measurements: During the experiment, we will monitor plankton dynamics, microbial dynamics and epipelon dynamics. These groups will be monitored in terms of biomass, but also elemental composition, and potential toxin (cyanobacteria) production. In addition, we will assess ecosystem processes, including primary production, decomposition, sediment biogeochemistry and greenhouse gas emission. All limnotrons will be monitored for standard limnological parameters, including measures light (PAR), temperature, pH, conductivity, oxygen, redox potential, turbidity, total Chl a and other algal pigments. We are open to discussing measuring other variables of interest with the TA applicants. We are planning a 4-month experiment for April-July 2018 within the Marie-Curie-ITN MANTEL program. We will investigate whether rehabilated systems are more resilient to extreme climatic events than non-rehabilated systems. The extreme climatic events we will mimic are extreme precipitation events, and extreme heatwaves. We will use phosphorus sorbents to geo-engineer our initial eutrophic starting conditions. The facility will also be open for participation of external users approved by AQUACOSM TA as of January 1, 2018 to the end of 2018 to perform their own research ideas. We also welcome collaboration outside the Transnational Access provision. We welcome microbiologists, molecular biologists, biogeochemists, and aquatic ecologists in general to participate in our extreme event experiment, and to come up with additional experiments. The facility will be open for participartion of external users as of April 1, 2018. At least 300 person days will be allocated to external users in 2018 of AQUACOSM Transnational Access provision. Access will be offered to a minimum of 10 persons for 30 days or other constellations. 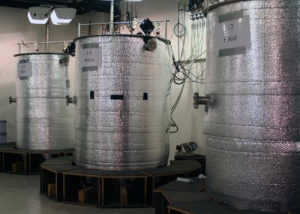 The Limnotrons at the Netherlands Institute of Ecology (NIOO) are 9 x 922 l (each 0.97 m diameter; 1.32-1.37 m length) indoor mesocosms made of stainless steel (Fig. 6.3.1). They provide an exceptional level of environmental control. 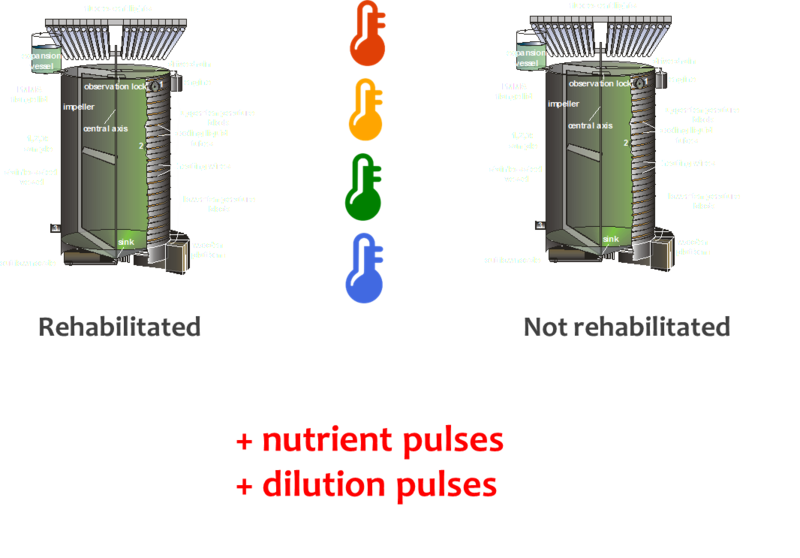 Temperature regulation by separate upper and lower temperature blocks enables the manipulation and control of thermal stratification in each individual Limnotron. A constant water level can be maintained with a refillable expansion vessel to compensate for evaporation and sampling losses. Complicated temperature scenarios can be realized by means of a powerful temperature programme. This includes the possibility to simulate episodic events. Temperature is logged every minute. CO2 levels can be manipulated by providing different CO2-air mixtures with a WITT KM60- 2ME gas mixer. High-intensity light supply and the option to include a 15-cm sediment layer allow for macrophyte growth. 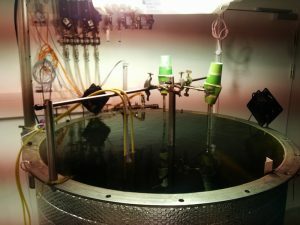 The Limnotrons can be closed with a removable lid, gently mixed with an impeller (which also prevents extensive periphyton growth on the Limnotron walls) or an oscillating grid (enabling cyanobacterial scum formation). The Limnotrons are particularly useful to assess effects of warming and CO2 on carbon cycling; the stoichiometry of trophic groups; nutrient balances; ecosystem metabolism; and the adaptation microevolution and community structure of phytoplankton, zooplankton, macrofauna, periphyton and macrophytes. Advanced analytical equipment, including a number of flow cytometers (e.g. flowcytometry, Cytobuoy, FlowCam, IRMS, molecular lab), which use laser technology to identify, count, and sort algae, bacteria, and protozoa at high speed. At least 900 person days will be allocated to external users in years 2-4 of AQUACOSM Transnational Access provision. Access is offered to a minimum of 10 persons for 30 days each year. Services currently offered by the infrastructure: Individual external users and user groups will have access to the full range of facilities at the NIOO. These include: fluorescence microscopes; autoanalyzer for dissolved nutrient;, multichannel probes for simultaneous measurements of oxygen, light, pH, conductivity and temperature; a PhytoPAM fluorometer; Coulter particle counter; Flow cytometers for the analysis of phyto- and bacterioplankton (<90 or <250 μm particle size), FlowCAM for automated analysis of large phyto- and zooplankton; elemental analyser to determine particulate C and N contents, Isotope-ratio mass spectrometry (IRMS) to determine the relative abundance of stable isotopes, ICP-MS to quantify trace elements, LC- MS/MS to analyse small organic chemicals such as cyanotoxins, and a modern molecular-biology lab. The facilities are frequently used for experiments by teams of international researchers from different disciplines, including ecologists, microbiologists, biogeochemists, and evolutionary biologists. Support offered under AQUACOSM: Users will be given full access to the facilities at the NIOO, and receive all training and assistance necessary to operate instruments and facilities before starting and during experiments. At present, the facilities are used by an international multidisciplinary team working on climate change and carbon cycling. This team consist of both internal and external users and is facilitated by a team of highly skilled technicians at NIOO. The laboratory’s broad range of state-of-the-art analytical equipment allows users to tackle innovative, multi-facetted questions, resulting in publications in leading journals. Users will be embedded in an internationally renowned aquatic ecology group providing ample opportunities for networking and large potential for fruitful scientific exchange. The NIOO as a whole (~200 employees) provides an international working community, hosting several world-leading scientists.